I admit. I am a bit of an adventure seeker. I love to explore, often alone. Independent woman that I am! Being new to Slovenia I want to discover new experiences and really see and feel what this beautiful country has to offer. So for me, Slovenia is a little slice of perfection. One weekend I felt inspired to explore more of Slovenia's coastal towns, and how better to do this than with a bicycle! No parking fees, no need for air-con, just me, my backpack and my bike. When I told others about my idea I got a mixed response, "You're going alone? Is that safe?" "What if you get a flat tire, how will you cope not speaking Slovenian?" "Awesome!" "I love your adventurous spirit"
Hmmm. Well, what you don't know, you don't know, until you do. I don't spend time with what ifs. I will figure it out as I go. Trains run pretty frequently from Ljubljana to Koper. My return ticket cost me 22 euro. Koper (the Slovenian port 106 km from Ljubljana) is the last stop on the railway. Izola is another 11.5 km from Koper. 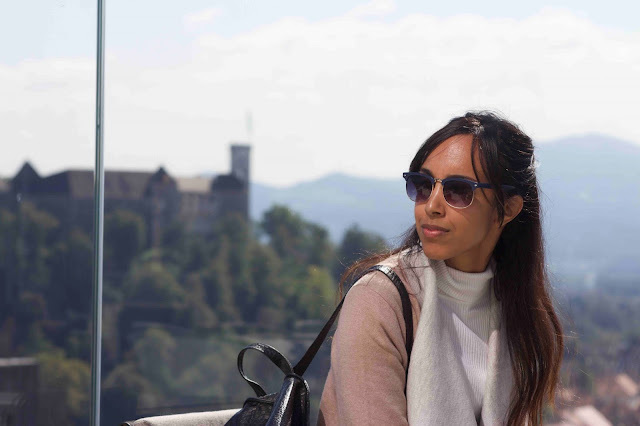 The 2.4 hour train journey was pleasant and actually quite comfortable, you're rocked into a peaceful lull as the train meanders through the Slovenian countryside, with its picturesque valleys, hills, quaint little towns and lush green forests. 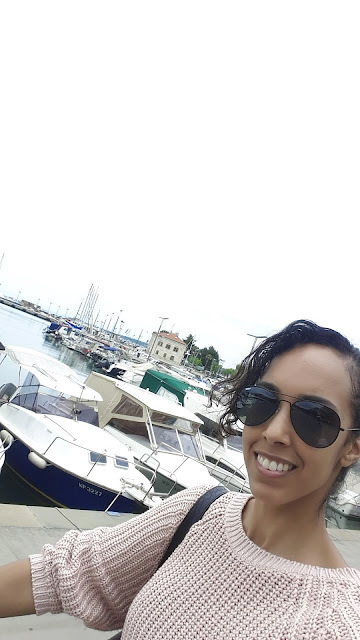 Once in Koper I headed towards the Marina and the Old Town (5-10 min ride). It was pretty simple to follow the signs along the way. At the marina I stopped at Kavarna Kapitanija - their smoothie and cake selection is FANTASTIC, even if you're vegan or gluten free they have something delicious for every diet. I opted for a 'kava z mlekom in zeleni smoothie.' Of course most people speak English in Slovenia, but I'm trying to practice as often as possible! From here I joined the sea-front cycle path that would take me to Izola, and to the Belvedere Resort which was 11.5 km away. It took me 50 minutes but I did stop for a few photo opportunities along the way so I reckon it would take about 30-45 minutes depending on your speed. The path follows the coastline, and is mostly flat until you reach Izola. 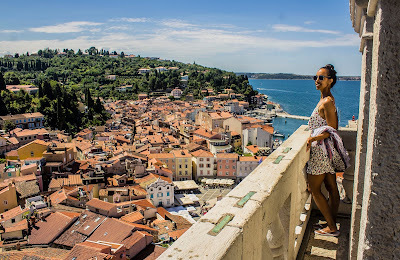 Izola (the Latin name for island is 'Izola') is an old picturesque fishing town, with abundant Mediterranean and Venetian influences which are clear to see. Izola was once an island (hence the name) that was connected to the mainland by a bridge. From Izola its another 9km km to Piran and then 3km onto Portoroz. But today I wasn't going that way. Today I was going up, heading for the Belvedere Resort which sits above Izola. Knowing I would soon be taking a dip in the Belvedere's outdoor freshwater pool and treating myself to a massage in their wellness spa powered me on. Go go go! I also had a coach. In my ear. I recently discovered Aaptiv - an audio fitness app you can download on your phone. You can stream audio-based fitness classes that combine the guidance of a trainer with the perfect playlist, giving you a better way to workout. Having a in-ear coach and upbeat music certainly helps you push past your comfort zone and get you training like a pro. I definitely needed something extra for this part of the journey, that's for sure. I'm going to be writing a full review on Aaptiv soon so you should definitely keep an eye out for that. In the meantime you can try their fitness app for FREE for 30 days, by clicking here! The Belvedere Resort sits 100m above sea level, making it the highest-lying hotel on the Slovenian coast. Designed by Slovenian architect Edo Mihevc, it stands in the Strunjan regional park. There's a hotel, self-catering villas and camping site, with outdoor and indoor pools, plus a wellness spa, so there's something to suit every taste and budget. The resort is also home to about 1,300 olive trees, which were planted in 1992, Belvedere uses organic production, harvesting olives by hand and pressing them for oil on the same day. The olive trees provide them with extra virgin olive oil from Slovenian Istria and are used generously in the Belvedere's Kamin restaurant. Belvedere’s Kamin Restaurant is protected as cultural heritage – the terrace provides an Instagram-stopping view of Izola and the Gulf of Trieste. When you reach the top the view is breath-taking. The feeling is exhilarating. I had done it. I had travelled to Izola by bike. Alone. I felt quite proud of myself. Staff are quite used to cyclists turning up for lunch in the Kamin restaurant or having coffee whilst taking in the view, so they didn't bat an eyelash with my huffing and puffing as I checked in, my heart still racing from the climb. I can see why they come. First the endorphin-inducing ride up the hill, then the view...Such beauty creates a stillness inside you, a calm feeling that you will want to linger. After spending the rest of the afternoon alternating between the pool and the wellness spa, it was finally time to follow my nose (the delicious aromas were calling out to me) towards the restaurant. Kamin has a seasonal menu which features traditional Istrian cusine and seafood specialities. I went for grilled squid (Kalamari na Zaru) with swiss chard (blitva) a traditional dish which you will see on most Slovenian menus. I was presented with a complimentary starter (compliments of the head chef) which was their homemade seeded bread, warm, fluffy, light and oh so gooood. Accompanied with a chicken liver pate and their aforementioned Belvedere Olive Oil. I love the freshness of eating this way, freshly caught fish, seasonal vegetables, home made bread and olive oils. I spent the evening dining al-fresco with my notepad and pen, feeling inspired to write. 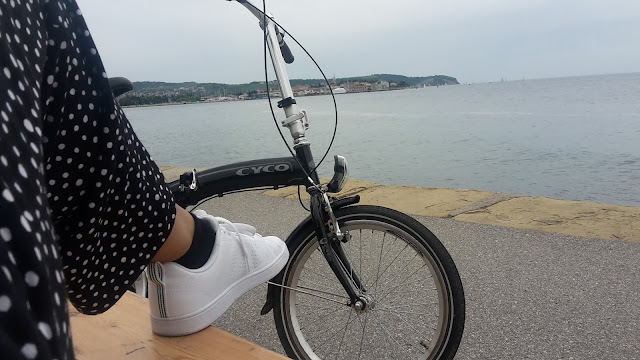 I thoroughly enjoyed my little bicycle adventure to Izola, I recommend you try it, carve out some small adventure for yourself, try something new, something challenging, something you've perhaps been thinking about for a while but haven't done it yet, you will thank yourself for it.